Shooting a full-moon requires some techniques that aren't "automatic". If you're lucky to get to photograph a SuperMoon, it can be up to 14% bigger and 30% brighter than a "normal" full moon. This eTip applies to any full-moon, "super" or otherwise. You need to expose properly. The first 2 items are pretty self-explanatory. You need a lens long enough to help enlarge the moon and a long focal-length lens requires a very stable base. Let's talk about the 3rd requirement: Exposure. What’s the correct exposure for shooting a full moon? If you shoot the full moon with auto (A), programmed (P), aperture priority (A or Av) or shutter priority (S or TV) exposure modes, you’ll be very unhappy with the results. That means if you are shooting at ISO 100, the correct exposure is an f16 aperture at 1/100 second shutter. If you are shooting at ISO 400, the exposure would be an f16 aperture at 1/400 second shutter. Pretty easy! This was more meaningful "back in the day" when we were shooting film with a manual camera that had no "auto" exposure modes. So, how does this translate to shooting the full moon? Well, based on #1 above, it means we have to shoot in Manual exposure mode. Secondly, let’s analyze the moon – how does it compare to the place where we normally take pictures - Earth. They’re both about the same distance from the light source (the sun). That’s all the analysis we need! Shooting images of the Moon's surface is no different than shooting here on Earth. The exposure is based on the "Sunny 16" rule. It may take a few shots to experiment, but the exposure should be close to f16 at 1/ISO. You may have to bracket, but that should get you pretty close to the correct exposure. What's wrong with Auto modes?? Why would one of the automatic exposure modes fail so badly? It has to do with all of that dark sky surrounding the moon. The camera see mostly dark sky and tries to lighten the sky. So, by letting more light in to "lighten" the sky, it grossly overexposes the moon, and all you get is a totally white blob. By using the correct exposure, you’ll get to see the texture in the moon, and the sky will be as dark as it should be. 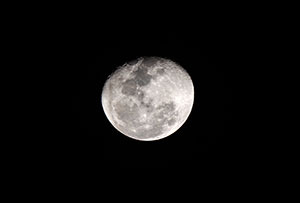 Moon photography can be a lot of fun - seeing heavenly bodies in our images adds a bit of diversity to our photography. A steady camera and getting the exposure right are critical to getting great moon images. Do it right, and you can get some great images.